Website pages are the building blocks of your company's website and advanced menus. Landing pages display content offers that attract new visitors to convert on your forms. If you're looking for design inspiration, check out customer examples from HubSpot Academy and the Design Forum. In your HubSpot account, navigate to your landing page or website pages. Click a template to use it as the layout of your new page. You can create a template or edit an existing template in the design manager tool. There are also templates available on the Marketplace. Give your page a name and click Create page. Hover over an existing page in your dashboard and click Edit. 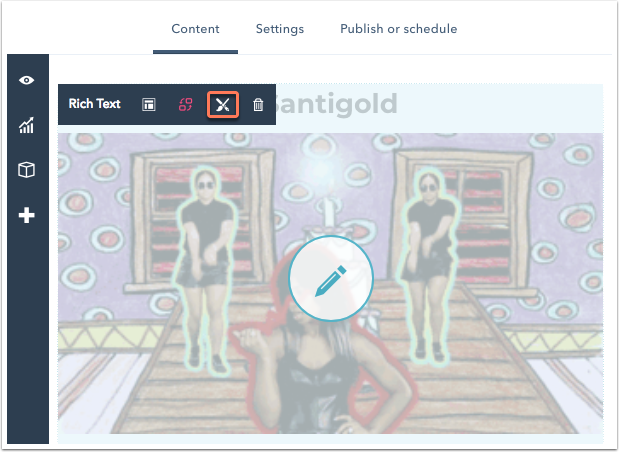 Once you're in the page editor, you can begin editing and optimizing your content. Hover over a module and click the pencil icon edit to make changes to its content and styling. To open a list of your page's modules to edit in the left sidebar editor, click the module icon integrations. 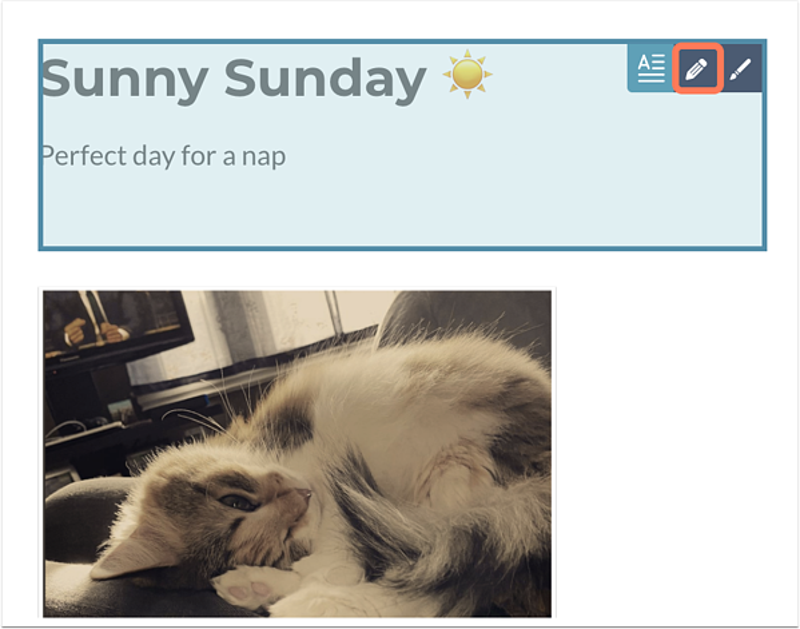 Click a module to make edits in the sidebar editor. Click Apply to see your changes reflected on the page editor as you work. Once you've finished making your edits, click Save and go to module list. Rich text, header, and single line text modules can all be modified directly in the page editor. The rest of your module types can be edited in the slide-in module sidebar editor. If your template contains flexible columns, you can edit or rearrange your modules in the page editor or in the module sidebar. To undo or redo an action in the page editor, click the undo icon undo or redo icon redo in the upper left. Only edits made during the current session in your web browser will be available to undo or redo. If you refresh the page editor, your previous edits will no longer be available. Hover over a module to apply styling. In the upper left, click the paint brush icon. A sidebar panel will appear with the styling options for that particular module. In the left sidebar navigation, click the bar graph icon on the sidebar navigation to open to the SEO optimizer. Here you can attach your page to one of your topics and review recommendations to improve your content. Internal page name: the internal page name is the name you added when you first created the page and is referred to in the dashboard. It is not shown to visitors. Page title: the title that displays in the tab at the top of your web browser when the page loads. Page URL: the URL for your page. It appears in the URL bar within the browser when visitors navigate to this page. You can edit your page URL even after it's been published. Add page to a menu: add the current website page you're working on to a new or existing advanced menu in your content settings. Meta description: the content that will appear in search results below the page title. Campaign: associate your page to a HubSpot campaign. Select Add new to create a new campaign. Featured image: click to toggle this switch on for a specific image to be featured when your page is shared on social media. Click Upload to select an image from your computer or Browse images to select an image from your file manager. 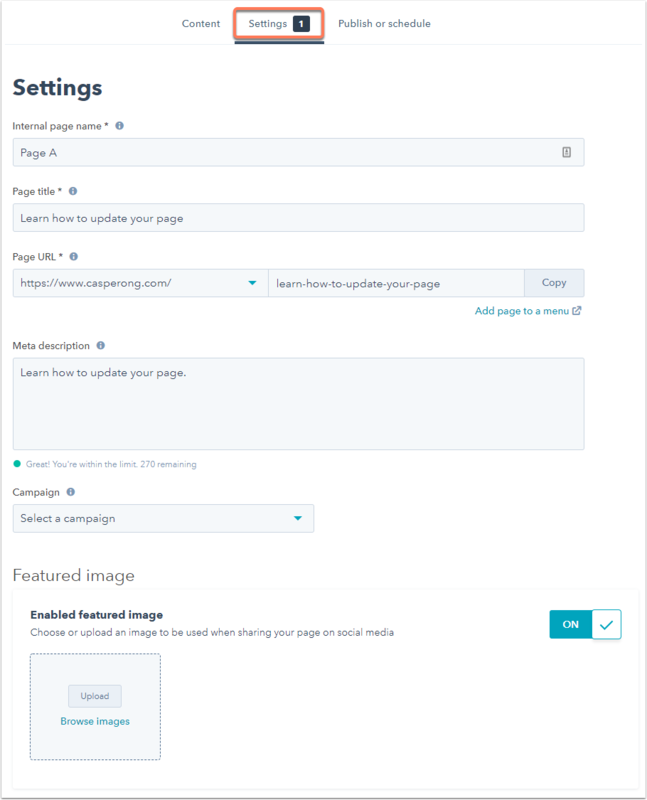 Click Advanced Options to customized more settings for your page. Note that these settings are not required to publish your page. Expire page on a specific date: select the checkbox to schedule your page to expire and redirect on a specific date. 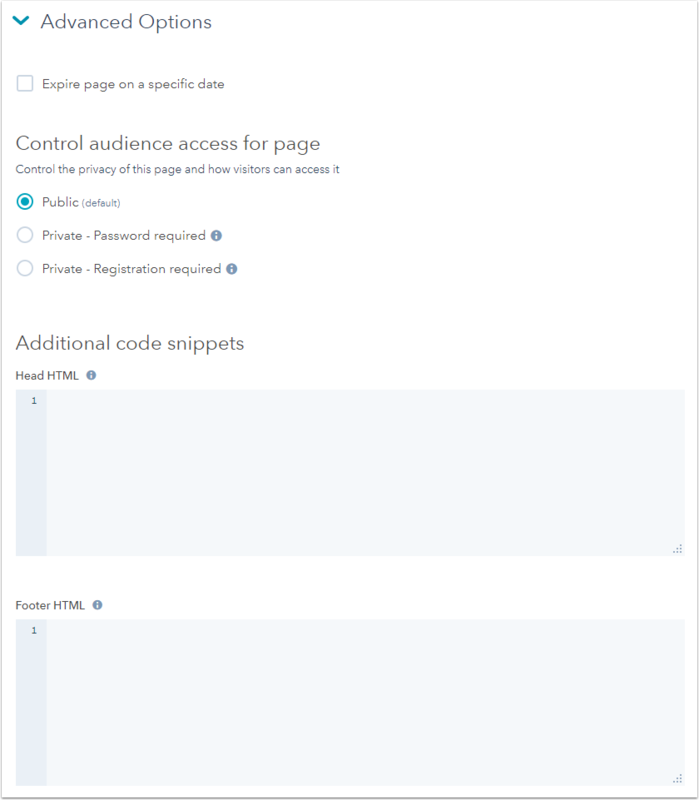 Control audience access for page: select an option to control audience access for this page. Select Private - Password required to add a required password for visitors to access your page content, or Private - Registration required to allow visitors to register with your site before viewing the page. Learn more about controlling audience access. Additional code snippets: add code snippets in the Head HTML or Footer HTML fields. This is useful for adding raw HTML or tracking code to the <head> or <footer> tag of your page. HubDB: if you use a HubDB table to manage a dynamic database, click the Select a table dropdown menu and select the table to add to your page. Template: view the template applied to your page. Click Use different template to apply a new template to your page, or Edit this template to edit your template. 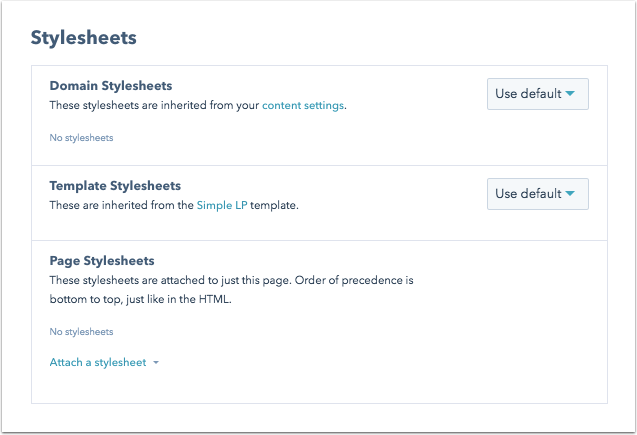 Stylesheets: manage the stylesheets attached to your page. To select if the default stylesheets should be enabled, disabled, or follow the default settings, click the dropdown menu and an option. Click Attach a stylesheet and select an existing stylesheet to attach to your page. Canonical URL: customize your page's canonical URL. Smart preview: use the Preview page as specific contact dropdown menu to choose a contact from your contacts database. This will show you how the page content will render for that specific visitor, which can help you preview any personalization or smart content on your page. Shareable preview: click Open in new window to see a live preview of your page in your browser. This preview link will work before your page is actually published. Click Copy to copy the link to your clipboard to share with your team. After you've added your content, optimized it for search engines, and reviewed the preview, you're ready to publish your page. 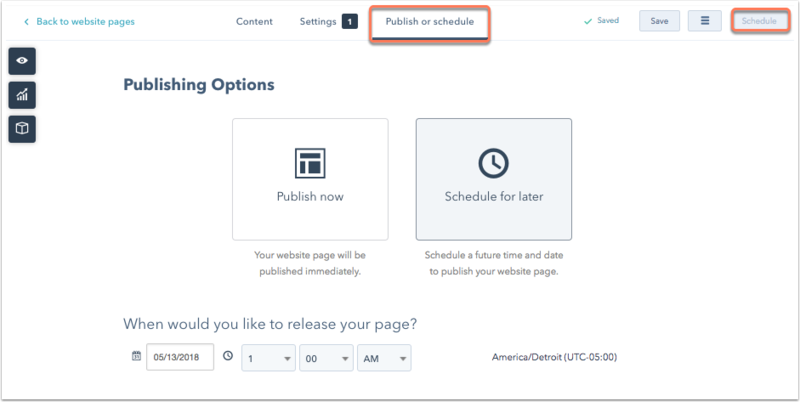 Click the Publish or schedule tab and select Publish now to publish immediately, or Schedule for later to publish it at a future date. Make sure you update the scheduled date and time.